He began writing about the subject with an article for Pitchfork in 2012, where he broke down the royalty rates of popular streaming services. 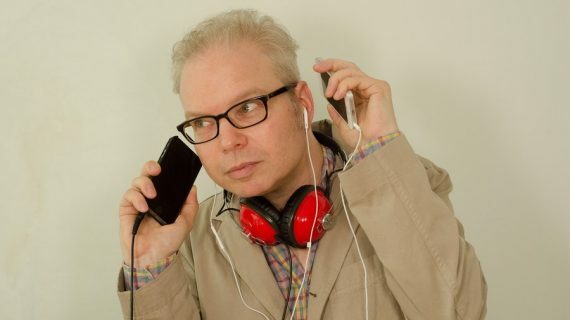 But with his book and accompanying podcast, Ways of Hearing, Krukowski cracks the subject wide open, examining it from scientific, technological, sociological, and emotional angles. It’s not a screed against progress; rather, it’s an insightful and beautifully written investigation of music’s true value. 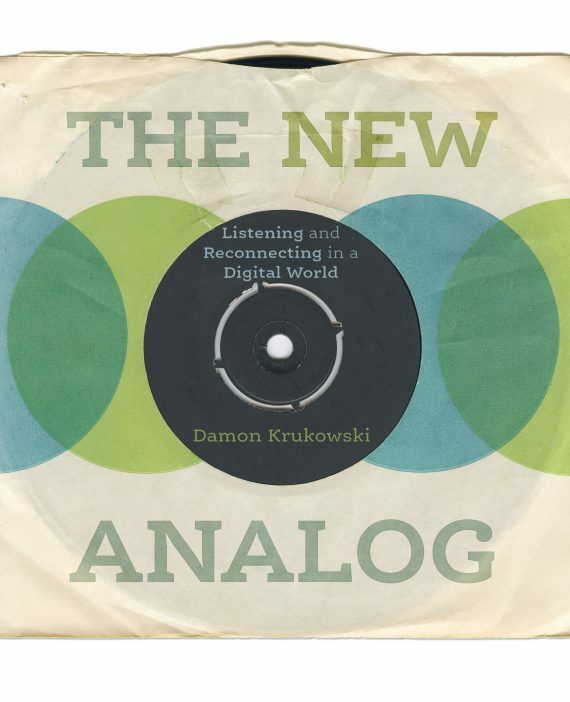 In a field of constant disruption, Krukowski holds up what might be worth preserving from the analog age, and how the “noise” of context adds to our understanding of, and connection to, the “signal” source of music itself. Last month, before the winter break, Krukowski joined Aquarium Drunkard on the phone from Massachusetts to explore the radical possibilities of streaming music, the role of nostalgia in his writing, and the importance of the fight for Net Neutrality. Our conversation, edited and condensed, follows. Aquarium Drunkard: Congrats on a great read. I picked up my copy at an independent bookstore, driving home from my job at an independent record store. So the questions you’re grappling with — about what we might be losing as our culture shifts around us — those are my kind of questions. In addition to purchasing music, I do stream, but this is not an “anti-streaming” book so much as it is a book asking some tough questions about how we stream. But let’s push that aside for a second and establish: What is your favorite thing about streaming? Damon Krukowski: I use streaming a lot, too. I feel that all these ways of sharing information are useful and have their place in our lives…so long as we keep them open and accessible enough that users can determine how they place them in their lives, I think that they’re all positive. What is scary about streaming to me is not the medium [itself] but the corporate control of it. It’s becoming so centrally-controlled by giant corporations. I mean, the size of Apple, the size of the competition at companies like Spotify, it’s mind-boggling. That’s not healthy. I think we’re in a worse situation than we were when we had a handful of competing major labels, because it’s even harder to go around these online corporations than it ever was to go around corporations monopolizing general distribution. In the indie record world it’s not so hard to distribute a record without going through the major labels. There are stores you can get to and there are buyers you can get to. It really doesn’t stop you from developing your own connections and your own business. But with the online thing…it’s hard to go around Spotify and Pandora and Apple Music without trying to introduce competition at the same level, like Tidal or something. It’s hard to develop your own independent means of connecting with your listeners. That to me is the danger from streaming. The medium itself I use constantly, though. I’m a big fan of Bandcamp. I love Bandcamp because it’s streaming without that kind of centralized control. It’s set up in a decentralized way, where everybody can post their material on it. It has a range of choices for how to present [that material] and how to charge for it. It feels more like a digital version of an independent distributor. I feel really comfortable having my music included in it and I don’t feel like my music has to be transformed into an unrecognizable format, and I do feel that happens on iTunes and Spotify, where you just get slotted into this weird thing which is filled with misinformation that you can’t change. There’s no one to call, there’s no one to contact, you really have zero control and relationship with the company. But I use streaming in other media, too. I’m streaming films online, like everybody now, because of the access to things I can’t see otherwise. ..I’ve spent an inordinate amount of time seeking things out like that on VHS and DVD, but they are not always available, and it’s great when you can just reach and find these things online. I’m not against streaming at all – quite the opposite actually. I’ve often advocated in public and in print for freeing streaming and freeing digital access to music, not the opposite. That doesn’t get repeated a lot in summaries of what I’m arguing, I think because it’s not a very welcome idea to so many people in the media. Every time I’m interviewed on the radio, for example, I always make this point, and it always gets cut out: I think that we should be royalty-free in streaming. I really feel that would solve a lot of problems. Just give up the idea that we are going to be paid for our streaming media, because if you pull that copyright part out of the equation, I think you’ve undercut the control that Apple and Spotify, etc. are exerting over the medium. It’s like a poison-pill strategy, but I think it would explode this corporate control, which is really risky. It’s connected to the Net Neutrality argument; it’s connected to the open access arguments that go on in the coding world. I just think music and media should be free online. AD: Help me understand how this would work in taking away some of the corporate control inherent in streaming. If you were to do that – and the artist didn’t make any royalties from their streams – wouldn’t the companies just continue making just as much money? Damon Krukowski: I think they would continue as they do, but they would no longer have the opportunity to present themselves as a monopolizing entity that controls all music. You could have true competition. If you think anybody could build a tool that could stream all music that is digitized and is out there, then why would you go to Spotify? You would have a true open market for the music, and I think it doesn’t solve the problem of how content creators earn a living in this environment, but Spotify isn’t solving that problem either. On the contrary, I think they’re driving us all out. They’re going to drive the labels out next. There was an excellent article by Liz Pelly for the Baffler. That was superb. She’s really a great journalist. She makes a really good point to the labels, if they’re listening, which is, “They’re coming for you next.” That seems so obvious to a lot of musicians because you sort of watch how they treat all of us, but the labels are acting like they are exempt. The major labels anyway, because they have part ownership and they are complicit in this structure. If you undercut that by just sacrificing this idea that we are controlling our music, because we’re not, then I think you also undercut their control. In Japan – we were just on tour in Japan – the contrast is so interesting. Japan still has a physical media market that is very healthy. There is still a Tower Records there. In Shibuya, the center of Tokyo, there is still a five-story, free-standing Tower Records building. And it’s packed with people! It’s not an unviable business. I was trying to find out why this worked or is continuing to work, and the best explanation I was given is that in Japan, the major labels refused to cooperate with the streaming services. Now, they didn’t do it for a good reason. They did it because they are so powerful that they thought they didn’t have to give up control. They each started their own streaming services, and insofar as you can stream online, apparently, it is more likely that you’re going to go to individual providers. They are not signing over their rights to an outside party like Spotify and as a result, they still have CD sales. I mean, it really seems to be as simple as that. Here, I think the industry was sold down the river by the majors being bought into Spotify and cutting their own deal. I’ve read that artists signed on those major labels felt sold out, because of course, the majors are the ones who negotiated the terrible royalty agreements on their behalf. What they really were doing was getting their own piece of the capital. I feel like this is a simple way to get rid of this. Just stop laying claim to your music. On Bandcamp, you stream free (you can restrict it a little bit, but most everybody up there allows streaming of everything), and then you can also sell downloads, and the two can coexist. But they’re not going to exist side-by-side with Apple. Apple is eliminating downloads as fast as they can because downloads remain something they have to pay the artist for. They’re trying to get rid of it. Meanwhile, at Spotify, they’re mysterious about it, but they seem to be doing everything they can ultimately to eliminate paying as many people as they can. The theme is not to pay for the copyright holders, so why don’t we just give it up? But anyway, I keep making that argument and I feel like it’s not really flying. AD: For many, the idea was that the internet was supposed to be a remarkable countercultural achievement – this system that was going to free all information. How we were going to become Star Trek, you know? All the ideas are going to be out there. I think we’re living in a time, especially right now, where independent bookstores, record stores, alt-weeklies –all of these things are under attack. The internet would seem to have been the place where we say, “OK we’re going to take all of this online. If it can’t exist in the physical world we’re going to take it online and it’s going to exist there.” But no, it’s under the same attacks there, and in some cases, even greater attacks. Damon Krukowski: Even greater, I agree. Because of the consolidation of the money involved, absolutely. I think the fight for Net Neutrality, for example, which is going on and is very active, the fight for open-source, the fight for freedom of information essentially online, is the real battle that has to be fought right now. As we shift everything to digital, this is the new place where we need to maintain freedom of information. The more we give up to corporate control, the greater dangers we are in. What is depressing to me is how voluntarily people surrender [their] freedom. Who knew that people would be so willing to say, “Yeah, track my every move. Yeah, go ahead, watch everything I’m doing.” Just for the sake of what? Usually, it’s sold as a convenience of some kind. [The marketing for] smart homes is just incredible. The idea that people would be willing to be surveilled in their own homes for the convenience of your refrigerator knowing that you need ice or something? I don’t get it. Or you don’t need to touch thermostat when the weather changes? Really? You’re going to let yourself be watched for that? It’s just so bizarre. So passive. But lo and behold, this is proving to be a very powerful strategy for these companies. Liz’s article, for example, talked about exactly that –the increasing passivity in listening to Spotify. The rise of the playlist for Spotify is so useful, it turns out, because people will just press a playlist based on some idea of what they want out of the music, rather than taking the active search of finding what music suits them. That’s the huge difference between going to a store, reading zines, figuring out what you like, talking to your friends, going to shows, and just pushing a button on your phone and having it provided. This idea of convenience is proving to be seductive. It’s not seductive to me personally, but I see that it is seductive. And I don’t condemn people for wanting to do this. I’m sure I do this in other parts of my life that I don’t have as much interest in, but at the same time the ramifications are just huge, obviously. We’re living through them. Politically, economically — it’s just a horror. I do think it comes down to that basic gesture of “do this for me” or “let this happen” and whether or not we’re comfortable with that. If I could push a button and have the leak in my roof fixed, rather than try and figure out where it’s coming from, then yeah, great. So maybe people just look at their cultural consumption as a problem to be solved of some kind? “Gee, I never know what to listen to, so this lets me push a button and that problem is solved.” I just don’t think that that is enough [of a reason] to let our cultural communications collapse. AD: If I make a Spotify playlist, it’s usually to send to somebody. It functions in the same way as a mixtape, and so on one hand, I absolutely see the functionality of it, and how it can facilitate a kind of sharing. Now, I think that is fundamentally different from what Liz is talking about in that piece, where somebody from Deerhoof is upset that Nike has co-opted their song for their brand playlist. There is no action to take in response. You could publicly state, “Nike, please don’t use my song,” but Nike hasn’t broken any law there. Damon Krukowski: Yeah, the only way would be not to participate in it at all, pull your music off of the systems. That’s not really an option, though, because you want your music heard. What musician doesn’t want their music heard? Which is also why I feel like the real gesture back, that would make sense to me, is, “OK, everybody can use my music however they want,” and relinquishing control, because control is being removed from us anyway. I think maybe that is hard for people to accept. It clearly has been hard for a lot of copyright holders to accept, but it’s the truth. It’s harder and harder to police the secondary use of your music anyway, so just let it go. And maybe, somewhere out of the chaos, we’ll all figure out a better way to still make a living. We’re not losing anything because we’re not making livings now. I was struck by the Deerhoof comment, also because they would be one of the few bands that would be willing to say, “I don’t want my music used this way.” But that has become an accepted behavior among bands, to just let your music be commercialized, however, because it’s one of the only ways we still get paid. AD: Yeah, it’s that or maybe licensing, in a film or TV show. Damon Krukowski: We’ve hardly ever said no to being [used in television or film.] Generally, we don’t say no — unless we have some objection to how we’re being synched. But to have nobody even presume to ask you [to use your music]? That’s what shifted in my experience. You can’t control a [brand’s] Spotify playlist. AD: My favorite element of the book is the way you line out how signal and noise exist together, and that often the “noise” that surrounds the “signal” of the recording is what gets lost on a streaming site like Pandora, Spotify, or Apple Music. Things like credits and notes. It’s easy enough to see how these sites could absolutely integrate those things; the digital medium is presented as an endless amount of space and freedom, so I could see, if I were dreaming it up and I had millions of dollars at my disposal, cool documentaries to accompany albums, and poetic readings and cover songs from other artists, in addition to credits and notes. Who knows? The amount of context that could be provided around this is endless. But I wonder if you have any insight as to why that seems to be of such little interest to these companies? Damon Krukowski: Yeah, I feel that it is always an inefficiency. Noise is always perceived as an inefficiency. It kind of is, by definition, if what you’re after is the signal. You’re always trying to strip away the noise because it’s just in the way. And “in the way” means not just in terms of perception, but also the efficiency of communication. In terms of music, the whole loss of credits and liner notes goes straight back to Napster. So, here was a guy, Shawn Fanning, trying to come up with an efficient bit of code that he could enable sharing of music over very slow lines of communication at the time, and very slow computers. Not only that, but without central servers, so you’re talking about computer to computer. It’s an extremely haphazard network… and the question was, “How can I make this efficient enough that it will actually successfully get the sound across the lines?” And he succeeded by cutting out everything else, except that MP3. That was genius insight and engineering. When the capabilities changed so drastically, and it gets tied into for-profit companies like Apple, who have endless resources, obviously at that point they could do anything. Or they could have done anything. But when they took over the Napster model, they did not add anything that Shawn Fanning didn’t already have, except a price. If you think about how Apple was looking at it, it’s like “Well this is a perfect engineering solution to the problem, missing one thing.” Which was the profit. So, they tacked on $0.99 per track, and that was it! And that kept it at that efficient minimum of communication. And that is the secret to all our modes of communication. Why they work, why they work well, why they work quickly, and cheaply. We’re all driving toward that kind of efficiency all the time. The argument that I wanted to make in the book was that drive to efficiency can be actually very harmful to full communication, to real communication. I think we all know that in face-to-face communications. If you meet someone who is so efficient in their face-to-face communications, that they drop all pretense to social niceties or human behavior, it’s creepy, right? They may be very efficient as business people, or whatever they’re trying to accomplish, but they are also completely creepy. We know the difference. So, if we know the difference, why don’t we ask for that difference or demand that difference in our media as well? I think in some ways we have just been blind to how important it was because it was always there. When you got the newspaper, yeah you may have been going for the headlines or the sports scores or the comics, but you got all the rest of it at the same time. It was taken for granted, the inefficiency was built into the system and you really didn’t think about the value of the inefficiencies in the system. I think that the challenge now with digital media, because it is such an efficient medium [is that we have] such huge pressures now driving toward this efficiency, it’s like we’re all on a spaceship designed by NASA. Nothing that isn’t essential to the mission is included. We’re all stuck in this digital world, it’s kind of like, “Woah, what happened to all these inefficiencies that actually were really useful?” It’s counter to profit, it’s counter to monopolization of corporate control, it’s counter to a whole lot of interests in our economy to demand inefficiency. Or include it. That’s why I think it hasn’t come back. Now on the flipside of that, the internet is still relatively open and free, and we are each free to build our own context around anything. It gets back to why we have to fight to keep that possible. Groups representing musicians like BMI fight these battles with these companies. [They can say,] “Put the credits back in.” You can fight that until you’re blue in the face, it’s not changing the fundamental problem in the system. But we each do have a very simple way of changing it, which is just act differently! Build context around media yourself. If you see that being shut down, that’s what you need to fight against. You know, at [some] point [they could take] YouTube away; I think YouTube is fantastic right now. It’s really chaotic. AD: Yeah, I love that about it. It can be so fun to wander down. And there is nothing so deflating as pulling up an old Tumblr post or a tweet or something and seeing the “This video is no longer available” notification. Damon Krukowski: Oh yeah it’s horrible. I was looking for an old post on my blog to remind myself of something and the link was gone. It’s really sad! I just think that’s where we have to fight to keep these channels open. But we can’t expect, unfortunately, Google and the like [to do that for us]. They are all now holding control over so many of these platforms and so much of the media. If they restrict the platforms, we just have to respond by keeping the media open, because other platforms can develop. But if they take away the media, we’re really in a hole, because we’re losing so many other means of communication. I lived through this in the book world, in a small way, because as you know I publish books under the name Exact Change. In the ’90s, there was a huge expansion of the book market, the surge of the chain stores like Barnes & Noble and Borders. There was a boom because of this centralization. What happened was, the consolidation of ordering was in the hands of these two companies. It allowed for a huge expansion of the market. We hired an assistant — I mean, even a small company like ours [could afford that]. Our orders were all increasing and then those companies went bust. The two of them. And they took down so much independent publishing with them. They’d killed off so many independent stores as they expanded, that when they closed, there was nowhere else in the areas they had taken over to sell books anymore. We lost distributors and wholesalers along the way. This efficiency of book-ordering and book-selling snapped back at the whole world of publishing and diminished it tremendously. In the wake of that expansion, we lost possibilities instead of having expanded them. I feel like we’re in the same situation, but again that isn’t a digital invention. I lived through this with the most clumsy analog medium possible, these heavy books that you have to ship around. They can get damaged in shipping. It’s just the most clumsy medium. In 2000-2001, we almost closed the business. We had to drastically change how we were [operating]. That was all the result of that same consolidation. So, it’s all by way of saying that the seduction of these platforms and their supposed efficiencies is really dangerous. You just have to make sure that when they disappear, because they will, they eat each other anyway, that we’re still left with the actual thing that we were trying to communicate with each other. You have to make sure you still have books in the world when the chain stores disappear. And that’s what we’re facing. Again, in the ‘90s we went through a version of it in music with the majors sort of stepping in and gobbling up so many independent channels of distribution. But the internet, for music, exploded that and went totally around it, where suddenly you could share the music without any store at all. So, you know, we’re still coping with that. That’s the big problem of digital for me. AD: Is the strategy for navigating that world to engage more with the systems that are in place? Or to completely subvert them –just kind of go around? Damon Krukowski: That’s a really good way to put the question in a nutshell. To me, it’s not to cooperate with these corporations. But it’s hard — for example, take something simple like planning a tour for February. These days, realistically, you must use Facebook to help you promote a tour, because it’s the only way a lot of people will find out about shows happening in town. Facebook has taken the role of fliers that we would tape up on lamp posts, or bulletin boards in record stores, and the ads in the alt-weekly, and of course editorial articles that people used to pay attention to that would help alert people that you were coming to town. Of all things, Facebook, the biggest corporate behemoth in the country, is playing the role of these really small gestures, of just telling people in town that might be interested in our small gig that we’re coming. The fact that we have to rely on this mammoth company to do the equivalent of taping up a poster in a store is just absurd. To me, the problem is that the more we rely on it, the fewer channels we have around it. People don’t tape up posters anymore, because why would you? You can post on Facebook. People don’t want to go out there and do that. It’s so inefficient and so useless really, by comparison. And then on top of that, you’ve got nobody else looking through those channels for what is coming to town. You don’t open up the weekly to check. I mean here in Boston, you don’t because we don’t have one anymore. You don’t see ads from the venues anymore, you only see these things posted in this kind of way. That to me is one of these instances where it’s like, “OK, if you take yourself off Facebook, that’s a problem because now you can’t even tell the few people that are interested that you’re coming?” But, if you use it and encourage this channel, you’re also cutting off the possibility of ever getting off Facebook, and that is the horrible catch-22 that we’re stuck in, because they’ve reached down to such small levels of communication. We don’t need to alert thousands and thousands of people that we’re coming to town. We only need to reach the few people we need. If you can keep those active channels of communication going outside the corporate network, then you have real community. But I just don’t think it’s community building to have Facebook groups, because for one Facebook can delete them tomorrow. We had this amazing thing just happen to us just now on tour in Japan: We get to Japan, we get off the plane, and for whatever obscure reasons, Facebook has decided that Naomi [Yang] is not her and her personal Facebook page has been hacked. So, they delete her account as we arrive in Japan. Now, it turns out Facebook Messenger in Japan is used a lot for people to make free phone calls and text each other. It was actually the only way we had to contact a subset of people that we wanted and needed to contact while we were in Japan. We just lost [that ability] because some stupid glitch in Facebook’s patrolling. We couldn’t contact anybody at Facebook. We tried every channel that was available online to us, and we couldn’t do it until we got back home. What a ridiculous situation — it can be removed in the blink of an eye. It’s like a hard drive crash, but it’s a community crash. AD: The possibility of social media is that it could allow us access to so much context – the ability to better know each other. But it feels like we’ve drilled down even deeper into only attempting to confirm our own biases. And look, I’m guilty of it, obviously. Damon Krukowski: We all are, yeah. That’s terrifying. And in some ways, I think that’s what we’re witnessing governmentally and in our society as a whole. A real influence of the ease with which you can hide things, or just not even have them presented to you. The act of hiding is still an active decision — you have to yourself own up to your decision. So that’s still in the realm to me of behavior that’s familiar to the analog world that we all do all the time. We make these decisions. We can’t live up to our own ideals but that’s reality. I don’t help every homeless person on the street and that’s a failing obviously, but it’s a failing that I live with and I have to deal with in my own conscience. But the weird thing that Facebook does is [allow you to say] “I don’t want homeless people to exist in my feed.” So, being confronted in the street with difference suddenly becomes unfamiliar to the way we lead our lives online. That difference is terrifying to me. In the early ’80s, Disney built this ideal suburb in Florida called “Celebration.” I remember visiting it when it first opened. Disney owned property near Orlando, and they were going into real estate development. They thought, “Well we built these ideal vacation fantasies for people, let’s build an ideal domestic fantasy for people.” They built this lily-white town and called it “Celebration.” Naomi and I were in Florida and we went and took the tour where they try and sell you a house, just to see how they pitched it. It was amazing! It was like entering this fantasy land. “There will be no problems in your life.” They explained how garbage was collected. You don’t even see it; you don’t need to put the garbage on the street in front of your house because there are service alleys in the back and the garbage will be whisked away without you ever seeing yours or your neighbor’s garbage can out on the curb. Ideas like that. Ways to make suburban life even cleaner and more antiseptic. They gave the whole presentation and asked, “OK, any questions?” We’re in this group and Naomi, who really has the most punk-rock streak of anyone I know says, “Where’s the cemetery?” And the answer was that there was none. There was no cemetery. So, we’re going to build a town without a cemetery. There will be no death in this town, because we’re just not going to include it as part of the possibility. Damon Krukowski: Right! Just hide it from me. Just don’t even tell me that there is death and I’ll just live in this Disneyfied place until I die. It is just an incredible erasure of fundamental facts of living. That was just us being kids poking fun at Disney, being snotty. But in some ways, I think that fantasy has come to pass online. Facebook kind of is a “Celebration”. It is a kind of online version of that. And the company Facebook is very Disney in that way of “We’re only going to give people what they want, whether or not that makes any sense.” Removing garbage and death from your town is nonsensical. But we’re gonna do it if that makes you feel better. That is what we get online. That’s what we just need to keep reminding ourselves, that they are feeding us this fantasy that can be seductive. We live in New England, so there is a cemetery in the center of every town. I cannot walk to the drugstore or the coffee shop without walking by a 17th-century cemetery with tombstones. That’s just a part of our daily life. That’s not something that is a choice to be eliminated, you know? Whether we do an end-run around these corporations or not [we have to] keep reality going. In terms of media like music, the reality is not everything is a pop song. There are many, many, many types of music out there. We should be using our incredible gift of access right now to reach all of it. Not the subset that sits on a playlist that suits your mood. A “Celebration” playlist. AD: We have more access to all kinds of music now, so my question is still: do we resist systems or find ways to navigate them? Damon Krukowski: I think it’s an individual responsibility. To me, maybe it’s a Pollyanna-ish feeling, but I feel like the more you share a record, the more people you’re going to find in the world who do connect with it. That at least has been our own personal experience. Certainly, Naomi and I have the potential to connect with so many more listeners now than we ever did. AD: And do you find that you are? Damon Krukowski: Oh yeah. I think we definitely do. We don’t learn it anymore through sales. There used to be this amazing shock, I’m talking decades ago, when you sold records in places you didn’t think you’d ever sell a record. Or you sold more numbers than you’d ever thought you’d sell. And it wasn’t that we were ever raking in the cash, it was more just this sense of, “Oh my God, there are more people out there than we thought who can connect with what we’re doing.” And that’s a tremendous sense of satisfaction. That measure has largely been removed because you don’t get the sales you used to get. You can’t track that kind of connection through the commercial medium anymore. But, at the same time, what is so clear is how many more people have access to our music and listen to it, and therefore how many more of them ultimately connect with it. When we experience it the most is when we travel, because we suddenly find our music has traveled further than we knew and connected to more people than we ever thought possible. And that’s an amazing feeling. It’s only possible because of the freedom of the internet. We definitely benefit from online sharing. I think we’ve benefitted from piracy, going back to Napster. That is how our music has become better known. We never had a company behind us that would just paper the world with our music so that everybody had the chance to hear it. But the internet does do that just by default. To me, even as we struggle against this situation that we’re all in now with digital media, I think it’s really important to remember how positive and how idealistic and how utopian it really is. It’s an amazing tool. Someone I look to as a model for the utopian side of it is Aaron Swartz…he was a genius programmer-thinker, who was very young. He ended up killing himself. It was a horrible tale of what happens when this kind of idealism comes into conflict with this corporate reality. What he did was, he was an advocate for internet freedom, and he went into the MIT libraries, and he downloaded all the copyrighted academic papers that the MIT library had access to, with the intention of sharing them for free online. That’s obviously breaking a lot of copyright laws. So, he was ultimately caught for this and prosecuted by the FBI. In the end, he killed himself while he was being prosecuted. There were many people rallying behind him and trying to fight to have this suit dropped…there’s a good documentary about it, and you can look up his writings as well. There’s a book published with them. The documentary about him called The Internet’s Own Boy. It’s no wonder that we’re running into trouble left and right because the idealism of the internet and the economic powers that are lined up against that idealism are in true conflict. And we can’t lose sight of that. It’s a real conflict. AD: To someone who hasn’t read your book, it might be easy to assume your position about streaming and digital music is, “Let’s not engage with this.” But that’s not at all what you’re writing about. Damon Krukowski: Yeah, it’s not how I feel. But it has been pointed out to me — I lay claim in the book’s beginning to more even-handed treatment that I think I gave it in the end. Because in the end, I do come down on the side of we are losing a lot that we have to worry about. I mean that’s really the thrust of the book. So that does start to sound like a Luddite position. But it’s not. It’s not what I mean, it’s not in my heart, it’s also not my practice. I still listen to LPs but I am not the person who says that is the only way to hear music, or to share it, at all. But I do think we have to continually remind ourselves as we are flooded with digital media what is not there, what is missing. To get back to the liner notes and the credits, that’s a great concrete illustration for people in music. It’s like, “Look, there was other information on these physical packages.” That does not mean that the physical package is the superior format, it just means we’re missing something in this new format that may be very valuable. AD: Nostalgia is not the driving force in this book. Damon Krukowski: Yeah, I really tried hard not to make it that. Especially because of my age. I am at the age now where nostalgia is a continual seductive trap, because when you’ve got more past to look at, the easier it is to fall into nostalgia. It is a kind of trap. Something that has kept me very anti-nostalgic — and I do have kind of a nostalgic streak in me — but something that keeps me at a distance from it is certain artists that I met in my life who were so anti-nostalgic and whom I admired so much. John Cage was one, and Chris Marker, the filmmaker was another. And Nancy Spero, the visual artist. These are older artists that I had the privilege of meeting who just couldn’t care less about their older work. They were so engaged in their current work, and what they were doing in the present. Robert Wyatt is that way, too. It’s so clear when you meet them, or when you really immerse yourself in their work, how they managed to not reject the history of their work or of their media, but at the same time, [resist] dwelling in nostalgia. They are completely focused on what is possible in the present. That’s a really great lesson that I feel like I tried to learn. But it takes a lot of discipline to do that. To go back to music, in our own experience, even going back to Galaxie 500, when you have a band and you start to do well, it’s very easy to fall into the idea of continuing to do whatever caused you to do well. Just keep doing the same thing. There is enormous pressure to do that…If you become more predictable, you really ultimately become more sellable. That is sort of like turning yourself into a logo or a caricature of who you are. It’s a constant commercial pressure that I think bands and we all face in our lives, too. You become a version of yourself that you’re comfortable with or seems to have some kind of successful interaction with the world. But falling into that trap is really dangerous, just in personal development too. You don’t want to be a caricature of exaggerated aspects of your personality. You know what I mean? You actually want to be all of yourself. That’s the anti-nostalgia thing to me. I did have an anti-nostalgic streak, it’s true in music going all the way back to Galaxie 500 where I just did not want to play the same thing we were expected to play. No, I don’t want to be exactly who you were just counting on me to be, it’s just too boring. And just literally playing the same songs night after night is not a very happy situation for a musician. I’ve seen many bands put up with that for commercial reasons or also just because it’s easy. It’s a good way out, it solves a lot of problems, to get back to the efficiency model. Cut out the noise of aspects of this music that don’t suit your current personality anymore, because that’s noise to the audience. They want the signal, they want the hits. I think every performer knows that struggle, somewhere in them. AD: At the same time, there are a few scenes in the book that are extremely evocative and really beautiful. They are drawn from the past, like when you talk about listening to Pink Floyd on your big headphones at home. Sometimes you talk about shopping and record stores and I found myself questioning a little bit the relationship between history and nostalgia. When you talk a little bit about resisting nostalgia, I wonder if there is a parallel that can be brought up with the disruption model, and the idea that we have to resist all vestiges of the past as we sort of barrel forward. But you see to be presenting something that’s a little bit more nuanced, that’s not all or nothing regarding the ideas of nostalgia? Damon Krukowski: You’re right to call me on that. I have a strong nostalgic streak and I can draw on it. AD: Those were some of my favorite parts of the book – you write evocatively about those memories. Damon Krukowski: Right and I do feel it. It’s like the lyrical impulse in me is often attached to the past. I do have that, and I can draw on it and I do draw on it because it’s an emotional truth for me, but it’s so interesting to put that next to disruption because you’re right. Disruption, the idea that you break entirely with the past in order to achieve these new efficiencies is a really dangerous model. But so is pure nostalgia. I think they’re both seductions that have to be resisted. When I was proposing the book, I was working with an agent. We went proposing the book to publishers, and the reaction was very clear to me. If I were to fall on one side or the other of that simple divide, I would have a more commercial property on my hands. If I could declare the future is bright or the future is black, it’s such an easy sell. If you go to the bookstore, you see that there are many books like that, and many of them are bestsellers because it’s a simple statement, and it’s a problem that we all wrestle with. It’s like saying, “I’ve got a simple answer.” I didn’t do it, and it’s another one of these turns in my life where I know I had a commercial potential possibility that I kind of stymied. [To just try and] pay my own bills [would be] a mistake. It just wouldn’t be honest and I knew I couldn’t do that, to just squelch the other half of the argument. I just can’t pitch it that way. So, I’m left with that in between, but I think it is because disruption is as much of a problem as pure nostalgia. Neither are true to the way we really experience the world, and I think that’s the problem with all these companies we’re facing. Uber is an amazing thing to watch right now, where the idea is “Just ignore the fact that we have this history of how to share cars on the street. Let’s just pretend none of that ever happened.” And then you hit up against a town like London, where the black cabs have so much history and so much culture involved in the city, and they actually resisted it. They organized and managed to stop it. And then you look at places on the West Coast, I mean for example when I was on my book tour in Portland, Oregon. I took the train from Seattle to Portland, I got out of the station and there were no metered cabs there. It was all only Uber and Lyft, there were no cabs anymore. It’s an interesting thing to watch every community wrestle with this black or white choice. Obviously, it’s not a good choice to be presented with. Eliminate your black cabs, or don’t make new efficiencies possible; both are awkward. That is where I ended up. So, the book is what it is, it was my attempt to be as reasoned as I could. But I have been called out even by friends, saying, “Well you said you were going to be even-handed and you really don’t come down very strongly in favor of digital.” It’s the moment we’re in right now. We’re not in a very idealistic moment about digital, I feel more we’re in a dangerous moment. AD: That’s the thing, you write a book, or you write anything and invariably you end up changing your mind about things. But I do think that in this current cultural moment, it’s probably best to just get these concerns out there, as this book does, and then let the conversation unfold.